A mafia film without cool dialogue, but lots of paintings. A love story without signs of affection, but plenty of gun fights. A road movie without a destination nor random guitar playing hitchhikers, but innumerable comfortable silences. Just about everything director/actor/writer/comedian/badass-genius Takeshi Kitano touches turns to gold, and this might be his masterpiece. It is one of the most award winning Asian films of all time. 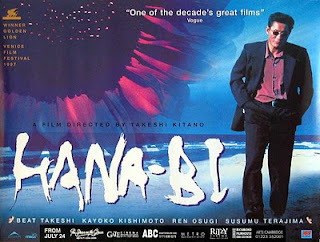 If you enjoyed Dolls, then Hana-Bi will make you tingle all over.